Air Rarotongas fleet consists of the Saab 340 or Brazilian twin-engine prop-jet aircraft, Embraer Bandeirantes.Beginning in 1978 with a small 5 passenger twin engine Cessna, numerous fleet additions and changes have occurred with expanded tourism services seeing the airline grow to its present size. More than 70,000 passengers travel on the airline’s inter-island services each year. All Air Rarotonga’s pilots and engineers are licensed by the New Zealand Civil Aviation Authority who also carry out regular technical audits to confirm the Company’s operating standards. Pilots undergo regular six monthly checks in the Saab 340 simulator based in Melbourne, Australia. 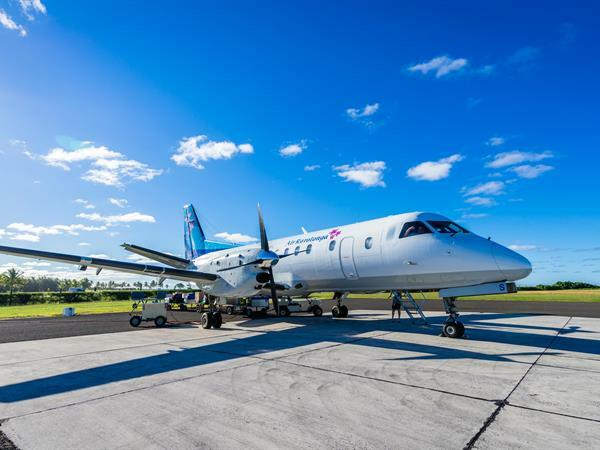 Air Rarotonga also operate scheduled passenger and cargo services between nine island destinations within the Cook Islands and non-scheduled demand charter to neighbouring Pacific Island countries including Tahiti, Niue, Tonga and Samoa. The company is privately owned, and incorporated in the Cook Islands with a dedicated team of over 50 staff.This airline has indeed become the Airline of the Cook Islands. These are public rates, available to anyone! more information * Rates above are for 1 Person. Sorry, rates and availability information is not accessible for selected dates. Please contact us by email: vacation@islandhopper.co.ck with your enquiry. Thank you. * Rates are correct at time of booking but may be subject to change without notice. Rates are rounded to the nearest whole number. Dates without rates are not able to be booked or are sold out. Kia Orana, how can we help? Our team are here to help you plan your dream Cook Islands holiday. We are fully committed to each and every client, and look forward to working with you to make your holiday experience a dream from beginning to end.